Apple already has schools lined up to participate. Duke University, the University of Alabama and the University of Oklahoma will launch programs this fall. Johns Hopkins, Santa Clara and Temple Universities will introduce the capability by the end of the year. 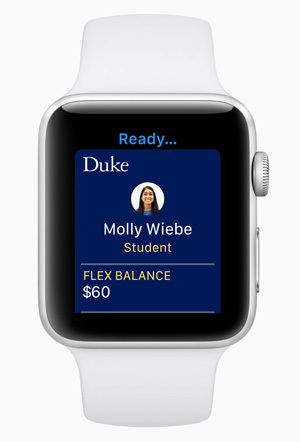 According to reporting by Duke University's student newspaper, The Chronicle, the participating institutions are all using Blackboard Transact, the company's campus ID card technology that works with near-field communication. WatchOS 5 adds several new features for helping people stay connected. An "activity sharing" feature lets a user invite another user to compete in week-long activity competitions that include point tracking for finishing activities and coaching notifications. "Walkie-Talkie" allows watch wearers to communicate with each other by voice with a tap of the wrist over WiFi or cellular service. Users can also listen to podcasts available with Apple Podcasts on their watches. As podcasts are listened to on any of the user's devices, the app will refresh with the latest episode. Developers working with WatchKit for watchOS 5 can enable audio sessions — whether lectures, music or audiobooks — from Pandora, Audible and 10% Happier to be synced to the Apple Watch for offline playback. WatchOS 5 will be available this fall as a free update for Apple Watch Series 1 and later and requires iPhone 5s or later running iOS 12. WatchOS 5 won't work on the original Apple Watch.